Adopt a new family tradition this Christmas with the return of The Elf on the Shelf® and experience the magic of the festive season! With just over 40 sleeps till Christmas, the popular children's illustrated book The Elf on the Shelf® is returning to Australia to add a little magic to your Christmas and capture the hearts of Australian families. An incredible self-publishing success - the enchanting tale of how Santa's Scout Elves help him manage his naughty or nice lists is a top best seller and has sold millions around the world since introduction. Each box set comes with a beautifully illustrated children's book that tells the story of Santa's helpers and their special role at Christmas time, along with a small Scout Elf, whose job is to watch during the day and report to Santa at night. When a family adopts a Scout Elf and gives it a name, the Scout Elf receives its Christmas magic and can fly to the North Pole each night to tell Santa Claus about all of the day's adventures. Each morning the Scout Elf returns to its family and perches in a different place to watch the festive fun, creating a unique family moment. Children love to race around the house and see where their Scout Elf has landed. Official adoption centres are opening now throughout Australia making the beloved Scout Elves available across the nation including Christmas shops, department stores, book sellers, toy retailers, and all Westfield shopping centres. This Scout Elf strikes the perfect pose in a nutcracker-themed outfit that includes gold embellished black buttons and belts that echoes the time-honoured decorating tradition. Up on her toes, this dainty Scout Elf dancer twirls around with a special toy soldier and takes centre stage with her ice-blue tulle skirt and shimmering bodice. Girl Power! This Scout Elf is ready in a flash for any super special Santa task while looking cheery in a candy cane-striped cape and dazzling snowflake shield. Keeping the Scout Elves cool wherever they go! Whether they're kicking back poolside or at an island paradise, this hip combination will definitely be a hit - especially when paired with the complimentary sunnies and cheerful lei. It's time for a Scout Elf snuggly moment! This sleeping bag offers the ultimate break for busy elves working hard during the holiday season. The set includes a starry night wraparound sleeping bag and mini felt bear with red bow. Ready, set, go! Scout elves are ready to glide down the white snowy slopes with their own tubes. This set includes an inflatable snow tube, fleecy earmuffs and a big cosy scarf. The heartwarming tale teaches children how helping others creates the Christmas cheer Santa needs to fulfil his Christmas Eve duties and more! Kids are encouraged to perform acts of kindness alongside the Saint Bernard pup, included in the beautifully illustrated hardbound children's book. 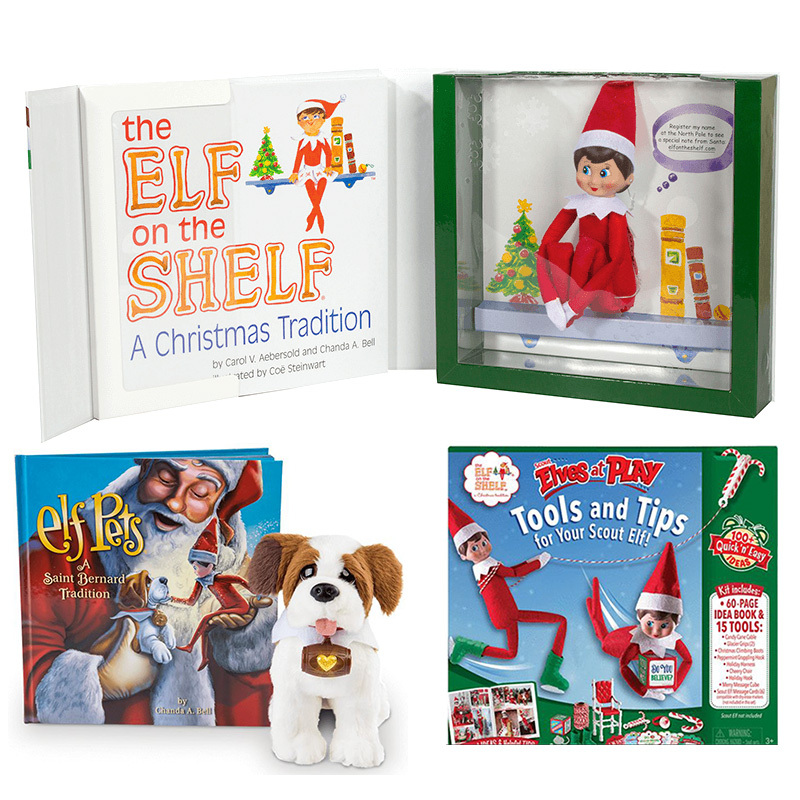 A fun kit that features tips and tools inspiring Scout Elves to create quick and easy scenes in their families' homes. The kit includes a 60-page idea book, 15 elf-sized tools and 135+ colourful photos to help create 100+ magical moments.